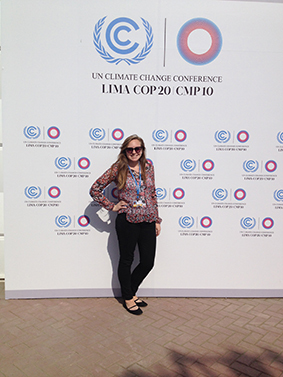 UA student Catherine King attend the United Nations Climate Change Talks in Peru. From the March 2015 Desktop News | Student Catherine King was one of only eight students nationwide selected to attend the United Nations international climate change conference in Lima, Peru, in December. King is a senior studying chemistry and chemical engineering at UA. Her role as a student delegate included interviewing world leaders and blogging about the talks she attended in an attempt to prompt others to take additional interest in climate change.  King was selected to attend the conference through the American Chemical Society, which chooses eight students to attend each year. King, a student researcher in Dr. Robin Rogers’s lab, is the third student from Rogers’s lab to attend the conference. Rogers is an adjunct professor in the Department of Chemistry and previously held the position of Robert Ramsay Chair of Chemistry and director of UA’s Center for Green Manufacturing. King attended a brief training session in Washington D.C., where she met government officials from the U.S. Department of Energy and the U.S. Department of State, before attending the first week of the two-week conference in Peru. She attended climate change talks organized by individual countries and nongovernmental organizations, and she blogged about her experiences, focusing on the impacts of climate change on the environment and mitigation policies that are being put into place. To read King’s and other students’ blog posts from the conference, visit http://www.studentsonclimatechange.com/student-blog/previous/4.